Native Americans were not included in the Treaty of Paris (1783), which concluded the American Revolution. The end of fighting presented them with a difficult path as they struggled to protect their homelands from their growing insignificance within the shifting international politics of eighteenth-century America. “To George Washington from the Seneca Chiefs, 1 December 1790”. In this lesson students will analyze a speech delivered in person by Cornplanter, chief of the Seneca tribe, to President George Washington on December 1, 1790. He delivered the address through a translator, and it was transcribed at the time. Cornplanter’s tribe was part of the Five Nations (later the Six Nations after the Tuscarora joined), also called the Iroquois Confederacy, which occupied the territory that is today upstate New York. Six excerpts accompanied by close reading questions will allow students to investigate changes in the relationship between the Americans and the Seneca after the Revolution, changes similar to those experienced by many Native American tribes along the east coast. This lesson approaches the post-war period from the perspective of the Native Americans and their ill-defined position in the new political landscape. In his speech Cornplanter reminds Washington that, as was the case with most of the Six Nations, the Seneca saw the American Revolution as a civil war and resisted becoming involved, even though they eventually declared a side. Based on their previous trade and diplomatic relations with Great Britain, the Seneca stood against the Rebels, which meant that after the Revolution they were forced to accept the role of a defeated nation. Cornplanter asks Washington to clarify the position of the Seneca and to honor treaty obligations of the past. His speech allows students to see the American victory in 1783 through a different lens, discovering the unsettling effects of the victory through the eyes of the Six Nations. This lesson is divided into two parts, both accessible below. The teacher’s guide includes a background note, the text analysis with responses to the close reading questions, an optional follow-up assignment, and access to two interactive exercises. The first allows students to explore vocabulary in context, while the second provides a review of Cornplanter’s main arguments. The student’s version, an interactive worksheet that can be e-mailed, contains all of the above except the responses to the close reading questions and the follow-up assignment. This lesson analyses a speech delivered on December 1, 1790, by Cornplanter (1746?–1836), a chief of the Seneca tribe, to President George Washington. The speech tells a story of trust and betrayal, weakness and power. To understand it, we must understand how the relationship between Indians and European newcomers evolved over the seventeenth and eighteenth centuries. The Seneca were part of the Five Nations (later to become the Six Nations after the Tuscarora joined), also called the Iroquois Confederacy. The Confederacy held what is today upstate New York. The Seneca occupied the western part of that area. Extremely powerful, the Six Nations controlled transportation and trade routes into the Ohio Valley. When Europeans arrived in America, the tribes considered their presence an opportunity to expand their trade and influence, and they established relationships with the Dutch, the British, and the French. During the French and Indian War (1754–63) the Confederacy allied with the victorious British. Before the War British settlers had been pushing into Indian territory. With the conclusion of fighting the Proclamation of 1763 forbade such intrusions, but settlers ignored it and continued to claim Indian lands. In 1768 colonial and Six Nation leaders met at Fort Stanwix in New York to draw up a treaty that would establish boundaries and keep settlers out of Indian territory. The treaty proved no more effective than the earlier Proclamation. The settlers kept coming. The United States of America, with the British possessions of Canada, Nova Scotia, New Brunswick and Newfoundland, 1794 (detail). As the American Revolution began, the Six Nations attempted to remain neutral; they considered the conflict a civil war and had no desire to become involved. As pressure from both sides increased, the British, in particular, insisted that the Six Nations ally with them. The tribes could not agree on which side to support, and the Confederacy split. The Oneida and Tuscarora supported the Americans; the Seneca, Mohawks, Onondagas, and Cayugas joined the British. Even though they fought on both sides in the American Revolution and inhabited territories negotiated between Great Britain and the United States, the Six Nations were ignored in the Treaty of Paris of 1783, which ended the war. Nonetheless, they hoped to retain both influence and control of their lands. The Six Nations maintained trade relations with the British, and their territory constituted a buffer between British forts in the Ohio Valley and what was then the northwest border of the United States. As strategic as that buffer was, Indian ownership of it represented an obstacle to the westward expansion of the United States. During the colonial period Native Americans would often lease land to settlers but retain the right to hunt on it or ask for food from the settlers. After the Revolution American leaders ended this practice and claimed the right to purchase Indian land. In the deals that followed, precise boundaries were difficult to determine because Indians did not survey their lands, marking them instead with pictographs, burial mounds, stones, or natural features. To settle various boundary disputes, Seneca chiefs, in 1784, returned to Fort Stanwix for a replay of the 1768 negotiations. This time they did not face representatives of a British colony but rather officials of a new, independent nation. While the treaty they signed drew boundaries, it also forced them to give up significant amounts of territory. In return, however, the treaty guaranteed that they would be secure in the possession of their remaining lands. However, even with the Fort Stanwix agreement in place, Indian land holding continued to shrink as speculators and government agents, both federal and state, laid claim to more and more territory. This relentless pressure on Indian land brought Cornplanter to Philadelphia, which had replaced New York as the national capitol in 1790, to ask Washington to confirm that the Seneca lands belong to the Seneca and could not be taken from them. Did Cornplanter succeed? In his response Washington stated that he could not enforce the land-protecting provisions of the 1784 Fort Stanwix treaty because it was made under the Articles of Confederation, which were no longer in effect. However, he assured Cornplanter that the United States would honor future treaties. Despite this, speculators and state governments continued to take Indian lands. By examining several key passages from Cornplanter’s speech, we will discover the arguments he deployed in his appeal to Washington, and we will get a sense of the plight of the tribes in the wake of the American Revolution. 1. In sentence 1 when Cornplanter refers to Washington as “the great counselor in whose heart the wise men of the thirteen fires have placed their wisdom,” to what is he referring? He is referring to the fact that Washington is president of the United States and he speaks for the thirteen separate states. 2. In sentence 4 Cornplanter’s reference to Washington as “the Town-destroyer” recalls a time during the American Revolution (1779) when he ordered the burning of Seneca villages. Why does Cornplanter bring this up? He wants to remind Washington that Cornplanter understands that he is a powerful warrior and has defeated the Seneca in the past. He also wants to remind Washington that the Seneca have suffered in the past. 3. In sentence 6 Cornplanter contrasts Washington’s role as soldier with his role as peace maker. What is the effect of this contrast? Cornplanter reminds Washington that although at one time they were enemies, they are no longer. It reminds Washington that the Seneca look to him for protection. 4. What is the importance of the use of the word “father” in sentence 6? It describes Washington’s current role as the protector of the Indians and their land. 5. In sentences 9 and 10 Cornplanter refers to the 1784 Treaty of Fort Stanwix. According to Cornplanter what happened there? Why? The Americans forced the Seneca to give up large areas of land without being paid anything. The Indians assumed the Americans did this because they still harbored animosity toward the Seneca for allying with the British during the Revolution. The Seneca thought that this treatment was unfair; they had hoped that the American’s anger had passed and were somewhat surprised to see that it had not. 6. In sentence 10 what hope does Cornplanter raise? He raises the possibility that Washington will reconsider the treaty of Fort Stanwix. Cornplanter sets the tone of his argument. To the great Councillor of the thirteen fires. The Speech of the Corn-planter, Half-town and the Great-Tree chiefs of the Senecca Nation. (1) …The voice of the Senecca Nation speaks to you the great Councillor, in whose heart, the wise men of the thirteen fires, have placed their wisdom. (2) It may be very small in your ears, & we therefore entreat you to hearken with attention. (3) For we are about to speak of things which are to us very great. (4) When your army entered the Country of the Six Nations, we called you the Town-destroyer and to this day, when that name is heard, our women look behind them and turn pale, and our children cling close to the neck of their mothers. (5) Our Councillors and warriors are men, and can not be afraid; but their hearts are grieved with the fears of our women & children, and desire, that it may be buried so deep, as to be heard no more. (6) When you gave us peace we called you father, because you promised to secure us in the possession of our Land. (7) Do this and so long as the Land shall remain that beloved name shall live in the heart of every Senecca…. (8) We mean to open our hearts before you, and we earnestly desire, that you will let us clearly understand, what you resolve to do. (9) When our chiefs returned from the treaty of fort Stanwix, and laid before our Council what had been done there our Nation was surprized to hear, how great a Country you had compelled them to give up, to you, without paying us any thing for it. (10) Every one said your hearts were yet swelled with resentment against us for what had happened during the war: but that one day you would reconsider it with more kindness. (11) We asked each other what we had done to deserve such severe chastisement. 7. In sentence 12, to what time is Cornplanter referring? How do you know? Cite evidence from the text. He is referring to the time before the American Revolution. His statement “kindled your thirteen fires separately” means the thirteen colonies were not yet one country but still separate colonies. When he speaks of being “the children of one great father,” he is referring to the English King. 8. According to Cornplanter, what was the relationship before the American Revolution between the Seneca and the colonists? The colonists and Indians were equals — brothers. Both groups were the children of the King “beyond the great waters where the sun first rises”. In sentences 12 and 13 Cornplanter states that all the white men were “brothers,” the children of one great Father who regarded also the red people as his children. 9. Cornplanter offers a reason to explain why the Seneca supported the British during the American Revolution. What is the reason? During the colonial period the British, the “wise men,” assured the Indians that both they and the British were children of a great Father, the King, who was powerful and good. The Seneca believed them and “promised to obey” this great Father. When the Revolution came, the Seneca kept their promise. 10. How does Cornplanter argue that in some ways the colonists were to blame for the Seneca supporting Britain? He maintains that the Seneca were simply doing what the Americans told them to do back when they (the Americans) were themselves British. The Seneca believed that the American rebellion did not nullify the promise they had made earlier to the British. 11. Why does he make this argument? He makes it in the hope that it will lessen the hostility of the Americans to the Indians. He referred to this hope earlier in sentence 10. Cornplanter explains why the Seneca fought against the Americans during the Revolution. 12. In sentence 22 Cornplanter refers to the American’s invitation to negotiate at Fort Stanwix. According to Cornplanter, how did the Americans persuade the Seneca to give up territory once the negotiations began? The Americans threatened them, noting that they had the power to crush the Seneca. The chiefs, realizing that they could not fight against that power, gave in to the American demands. 13. Cornplanter closes sentence 23 by saying “as if our want of strength had destroyed our rights.” What does he mean by this statement? 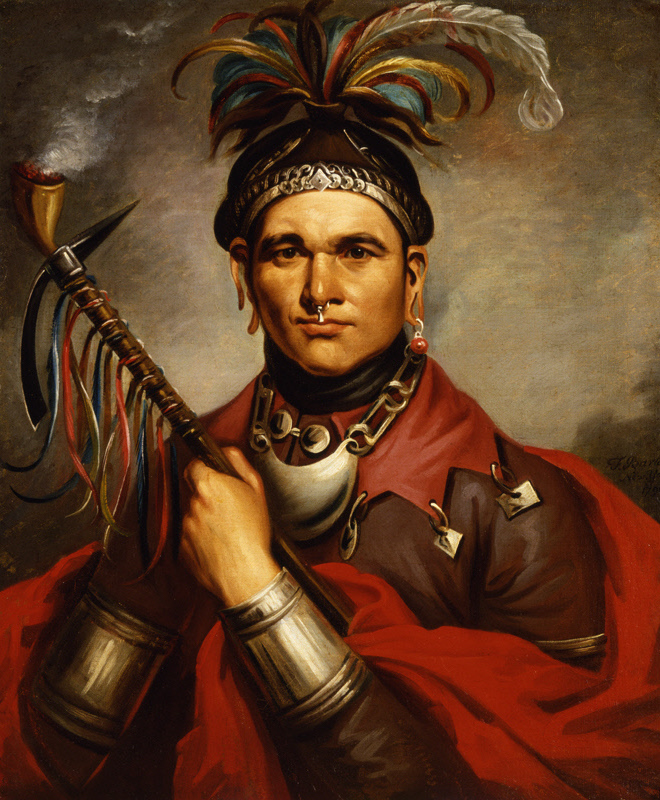 Cornplanter means that even though the Seneca are weak, suffering from a “want of strength,” they still have rights. In sentence 26 he, in effect, asks Washington to consider the America’s treatment of the Seneca in view of those rights. 14. Cornplanter closes this paragraph with a question, using it to encourage Washington to think about the situation in another way. What exactly is Cornplanter asking Washington to do? He is asking him to “consider calmly were the terms dictated to us reasonable and just”. He wants Washington to reconsider the terms of the 1784 Treaty of Fort Stanwix. Cornplanter maintains that the Americans took advantage of the Seneca’s weakness. (22) When we saw we were deceived and heard the invitation which you gave us to draw near to the fire you had kindled and talk with you concerning peace we made haste towards it. (23) You then told us we were in your hand & that by closing it you could crush us to nothing; and you demanded of us a great Country as the price of that peace you had offered us; as if our want of strength had destroyed our rights. (24) Our Chiefs had felt your power & were unable to contend against you and they therefore gave up that Country. (25) What they agreed to has bound our nation. (26) But your anger against us must by this time be cooled, and altho’ our Strength has not encreased nor your power become less we ask you to consider calmly were the terms dictated to us reasonable and just? 15. Cornplanter ends the first paragraph of this excerpt with a question. What is he asking? He wants to know if Washington will abide by the boundary lines drawn in the 1784 treaty with the Seneca. 16. According to Cornplanter, what happened after the signing of the Treaty of Fort Stanwix? Immediately after the signing of the Treaty, commissioners from the state of Pennsylvania sought to purchase land that was supposed to be protected by the Treaty. When the Seneca refused to sell all the land the commissioners wanted and offered instead only a portion, the commissioners told them that the King of England had given them the land in the treaty that ended the Revolution. 17. How did the Seneca respond to the news that the King had the right to cede their lands to others? They were confused by it. Here they ask Washington to explain it to them. Later on they will flatly assert that the King did not have that right. 18. Why does Seneca raise the Phelps incident to Washington? He does so to illustrate another problem the Seneca face, the pressure of land speculators who deceive them. 19. What does the Phelps incident tell us about the situation of the Seneca? It illustrates their weakness by highlighting their vulnerability to being defrauded and their inability to find redress when they are swindled. 20. What argument does Phelps make to claim the Seneca’s land? Like the Pennsylvania commissioners, he asserts that the King of England had given the land to Americans from whom he had purchased it. He is, in effect, saying that he already owns the land. 21. How do the Seneca respond to this use of the argument that the British king gave Indian lands to the Americans? As before, they express confusion. Activity: Do You and Cornplanter Think Alike? Compare your diplomacy skills with Cornplanter’s by providing three arguments against America’s claim to Six Nations territory. Cornplanter cites an argument Americans have used to claim Indian lands. (27) …Your commissioners when they drew the line which separated the land then given up to you, from that which you agreed should remain to be ours did, most solemnly promise, that we should be secured in the peaceable possession of the lands which we inhabited, East, & North, of that line. (28) Does this promise bind you? (29) Hear now we entreat you, what has since happened, concerning that Land. (30) On the day on which we finished the treaty at fort Stanwix, commissioners from Pennsylvania, told our chiefs, that they had come there to purchase from us, all the Lands belonging to us within the lines of their State, and they told us that their line would strike the river Susquehanna below Tioga branch. (31) They then left us to consider the bargain ’till the next day. (32) On the next day we let them know, that we were unwilling to sell all the Lands within their State, and proposed to let them have a part of it which we pointed to them in their map. (33) They told us they must have the whole: That it was already ceded to them by the great King at the time of making peace with you, and was their own. (34) But they said they would not take advantage of that, and were willing to pay us for it after the manner of their Ancestors. (35) Our chiefs were unable to contend at that time, & therefore they sold the Lands…. (36) Since that time we have heard so much of the right to our lands which the King gave when you made peace with him that it is our earnest desire you will tell us what they mean…. (37) For [a large piece of] Land Phelps [a land speculator] agreed to pay us Ten thousand dollars in hand [immediately] and one thousand dollars a year for ever. (38) He paid us two thousand & five hundred dollars in hand part of the Ten thousand, and he sent for us last Spring to come and receive our money; but instead of paying us the remainder of the Ten Thousand dollars, and the one thousand dollars due for the first year, he offered us no more than five hundred dollars, and insisted he had agreed with us for that sum only to be paid yearly. (39) We debated with him six days during all which time he persisted in refusing to pay us our just demand…. (40) The last reason he assigned for continuing to refuse paying us was, that the King had ceded the lands to the thirteen fires and that he had bought them from you and paid you for them. (41) We could bear this confusion no longer, & determined to press thro’ every difficulty, and lift up our voice that you might hear us, and to claim that security in the possession of our lands which your commissioners so solemnly promised us, and we now entreat you to enquire into our complaints and redress our wrongs…. 22. What does the first paragraph tell us about the Seneca state of mind? The Seneca are desperate. The loss of their land and the uncertainty of their condition have driven them to prefer death over life. 23. In paragraph 3 what arguments does Cornplanter make against the legitimacy of the 1768 Treaty of Fort Stanwix? He argues that only a few Six Nation chiefs were present at the negotiations, and they were forced to sign and give up their lands. 24. How did other tribes in the region react to the Treaty? They criticized the chiefs who negotiated the Treaty for giving us so much land. Moreover, because they felt that they may not have “a place…to lie down on,” they threatened war. 25. How did the Seneca respond when other tribes called on them to war against the Americans? They asked them to wait until the Seneca could talk to the Americans. 26. Why does Cornplanter tell Washington that the Seneca persuaded the tribes not to go to war? He wants strengthen his case by illustrating how valuable the Seneca are to Washington in keeping the peace on the northwestern frontier. 27. In this excerpt what warning is Cornplanter delivering to Washington? He is telling him that there is unrest on America’s northwestern border and that if the Indians’ problems are not addressed, if he cannot assure the tribes that they will have a place “to lie down on,” there will be war. Cornplanter warns Washington of unrest on America’s northwestern border. (42) You have said we were in your hand, and that by closing it, you could crush us to nothing. Are you determined to crush us? (43) If you are, tell us so that those of our nation who have become your children & are determined to die so, may know what to do: In this case one chief has said, he would ask you to put him out of pain: Another, who will not think of dying by the hand of his father, has said he will retire to the Chataughque, eat of the faral root, and sleep with his fathers in peace. (45) When that great Country was given up, there were but few Chiefs present, and they were compelled to give it up. (46) And it is not the Six nations only, that reproach those Chiefs, with having given up that Country; the Chipaways and all the nations who lived on those lands westward, call to us & ask us brothers of our fathers where is the place which you have reserved for us to lie down on. (50) We will not conceal from you, that the great God, and not man has preserved the Corn planter from his own nation: for they ask continually, where is the Land which our children and their children after them are to lie down on?…. 28. Why has Cornplanter given “all that he had in store” to “those who have been robbed”? 29. How have Cornplanter’s peace-making efforts affected his family? He has been unable to to provide for his family, and now they are suffering from lack of food. 30. According to Cornplanter, how have the Seneca interpreted the departure of game from their lands? They believe it is a sign from the Great Spirit that they, like the white man, should plow the soil. 31. How does Cornplanter refute argument that the British king gave Indian lands to the Americans after the Revolution? He asserts that the king never owned the lands in the first place. God gave the land to the ancestors of the current generation, and they will in turn to pass it to the next. 32. What finally does Cornplanter ask of Washington? He asks whether the Americans plan to leave the Seneca with any lands at all. Review the central arguments in Cornplanter’s speech to George Washington. Cornplanter speaks of his personal sacrifice and the plight of his people. (51) He loves peace, and all that he had in store he has given to those who have been robbed by your people, lest they should plunder the innocent to repay themselves: the whole season which others employed in providing for their families, he has spent in his endeavors to preserve peace. (52) And at this moment his wife and children are lying on the Ground in want of food. (53) His heart is in pain for them; but he perceives that the great God will try his firmness in doing what is right. (54) The Game which the great Spirit sent into our Country for us to eat, is going from among us: We thought he intended we should till the ground as the white people do, and we talked to one another about it. (55) But before we speak to you of this, we must know from you, whether you mean to leave us, and our children, any land to till. (56) Speak plainly to us concerning this great business. (57) All the Lands we have been speaking of belonged to the Six Nations: no part of it ever belonged to the King of England, and he could not give it to you. (58) The Land we live on our Fathers received from God, and they transmitted it to us, for our Children and we cannot part with it…. (59) These are to us very great things. (60) We know that you are strong and we have heard that you are wise; and we wait to hear your answer to what we have said that we may know that you are just. Although it is my sincere desire in looking forward to endeavour to promote your happiness by all just and humane arrangements; yet I cannot disannull [erase] treaties formed by the United States before my administration, especially as the boundaries mentioned therein have been twice confirmed by yourselves. The lines fixed at Fort Stanwix…must therefore remain established. But why did Cornplanter agree to give up land at Fort Stanwix? At the Conference of Fort Stanwix in 1784, only one year after the Treaty of Paris of 1783 than ended the American Revolution, several conflicting powers competed for control of Indian lands. New state boundaries often overlapped, and western borders extended to the Pacific Ocean regardless of Native American territories. 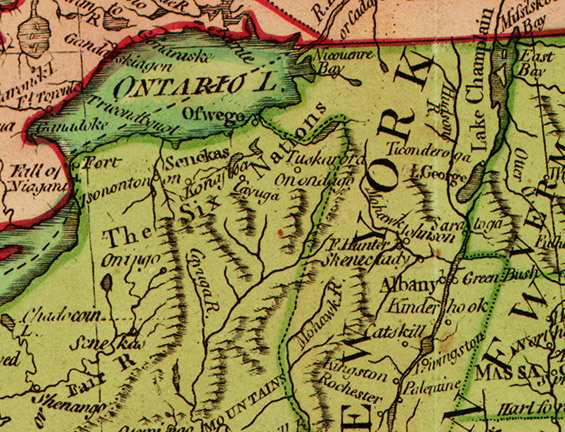 The state of New York, intent upon controlling the lands of the region, distrusted the negotiators from the federal government, fearing that they might want to deprive New York of their land altogether and make a new state. Massachusetts was determined to gain the lands for Massachusetts, since they owned a grant from the English King dated 1630 (New York’s charter was dated 1663). Both these states wanted the lands to sell to speculators in order to raise money and help pay their war debts from the American Revolution. Another issue arose — according to the Articles of Confederation, individual states managed Indian affairs within their own boundaries while the federal government managed affairs of tribes outside individual state boundaries. But the boundaries were unclear. All three governments claimed the right to control the lands of the Six Nations. Suspicious of the purpose of the Fort Stanwix Conference, the Iroquois, still technically allied with the British, sent a limited number of delegates to the Conference, including Cornplanter, who served as one of the two major Iroquois spokesmen. The Iroquois signed the treaty terms as required by federal negotiators, who, supported by a strong military presence, dealt with the Iroquois as a conquered nation. The new 1784 boundary line took huge sections of land from the Six Nations, separating the tribes from their former British allies and reminding the Iroquois that they must look to the U.S. alone for protection and help. It also helped to separate the Six Nations from other Native tribes in the Ohio Valley in order to prevent them from organizing an uprising. The Fort Stanwix Treaty of 1784 was rejected by a Six Nations council as one forced upon delegates against their wills, but the Americans ignored this response and proceeded to occupy the lands. So how would you settle the problem of Indian lands after the American Revolution? Remember, British forts are still active and manned with soldiers in the Ohio Valley region and Canada, lending all but military support to Native Tribes; different states with unclear boundaries are claiming ownership of the lands for money and their own border security; the federal government has weak power under the Articles of Confederation but wishes both to control the rate at which settlers move west into Indian lands and establish a strong border for national defense; speculators are buying and selling land rights from different states and with different chiefs for personal profit; and there are no phones or internet. Create a clear plan for how to resolve this problem. How will the land be divided? How will the parties know boundary locations? What about the Native Americans — will they lose hunting and fishing grounds? How will they live? Develop your plan and share it with your classmates. “To George Washington from the Seneca Chiefs, 1 December 1790,” Founders Online, National Archives (http://founders.archives.gov/documents/Washington/05-07-02-0005, ver. 2014-05-09). Source: The Papers of George Washington, Presidential Series, vol. 7, 1 December 1790 – 21 March 1791, ed. Jack D. Warren, Jr. Charlottesville: University Press of Virginia, 1998, pp. 7–16. Laurie, Robert & Whittle, James. The United States of America, with the British possessions of Canada, Nova Scotia, New Brunswick and Newfoundland. Map, detail. London: Laurie & Whittle, 1794. From Library of Congress Geography and Map Division. http://www.loc.gov/item/98685649/ (accessed November 2014).